BSNL has announced the withdrawal of ‘Call Forwarding STV 72’ and Call Forwarding Add-on-pack 22 offering for Prepaid users and Postpaid users on PAN India basis. State run Telecom Company Bharat Sanchar Nigam Limited (BSNL) offering Free Call Forwarding for Prepaid users using Special Tariff Voucher of Rs.72 and for Postpaid users with Add-on-pack of Rs.22 under GSM mobile services. 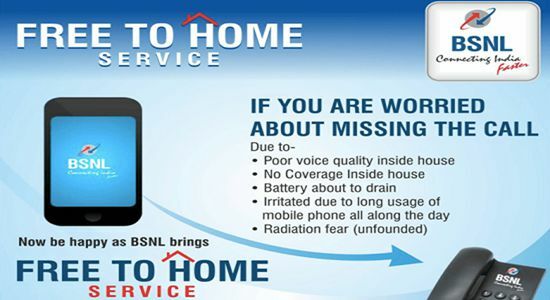 As per latest information, BSNL competent authority has decided after launch of ‘FREE To HOME Services’ on PAN India basis. BSNL Free to Home Service offers absolutely Free Call Forwarding facility to BSNL Landline numbers for BSNL mobile customers (both Prepaid and Postpaid services). Under ‘Free to Home service’ BSNL allows its mobile users to forward their mobile calls to any BSNL Landline number as per customer choice. The above service will be offered @ Free of cost to calls forwarded to Landline numbers within the circle and will continue to be free while in Roaming. However, calls forwarded to Landline numbers outside the circle will be charged according to the existing bsnl tariff.